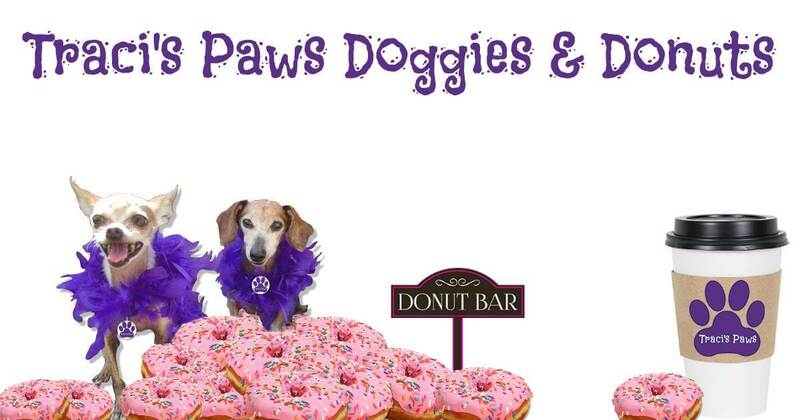 Excited to roll out our 2nd year of “Doggies & Donuts,” the coolest adoption/networking/meet-up event in San Diego! This event is perfect for anyone who loves dogs, wants to adopt a dog, looking for a pet service like a groomer or sitter, a new vet, and for all pet services to network with prospective clients! Dog Rescues – Want to bring adoptable pups? Please email us at SavePets@TracisPaws.com for complete details. Free to enter, but you must return a Rescue Entry Form that we’ll send you, so we can add you to our marketing materials! Dog Businesses – (Pet Supply Stores, Pet Photography, Pet Sitters, Pet Walkers, etc…)Bring your business cards. We will not have tents or tables, this is a face-to-face networking event. If you want to attend, send an email SavePets@TracisPaws.com for a FB shoutout to event guests. GUESTS – This is a FREE event! Thrilled we will be partnering up with Donut Bar, for tasty treats at each event, and a generous local business sponsoring them for us! We also want to thank Niko and his team at Quartyard for hosting these tasty events!